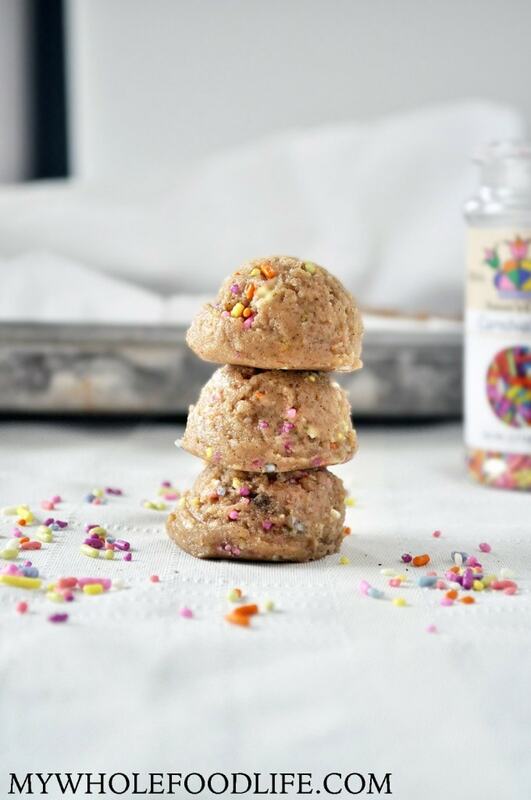 Funfetti Cookie Dough Bites that are vegan! Lately, I have been making a lot of sweet treats. After all, we are in the holiday season! No bake and you can whip them up in minutes! All you need is 5 ingredients. These no bake bites are vegan, gluten free and paleo approved. You have to try them! My daughter really had fun making these with me. Especially adding the sprinkles in! What kid doesn’t like sprinkles? The perfect no bake cookie! In a food processor , combine all the ingredients except the sprinkles. Once everything is mixed well, add the sprinkles. Use a cookie scoop to drop cookies onto a lined baking sheet . If the dough looks a little soft, you can stick the food processor bowl into the fridge for 10 minutes to firm it up. Leave the cookie dough balls in the fridge to firm up. About 30 minutes. These should keep in the fridge for at least 2 weeks. They can also be frozen for longer. Enjoy! That is disappointing. :( Well these are just as delicious without the sprinkles if you want to make them that way! I had no idea about the glaze. I'm sure that I will enjoy them! I mean - so colorful! What non nut flour could be substituted for almond flour in there? These are delicious bringing them to work for our holiday dessert potluck! !